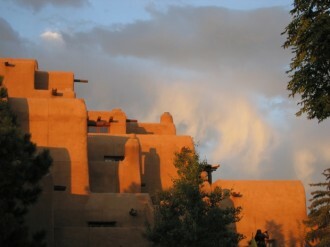 Santa Fe adobe in the late afternoon sun. From the Inn and Spa at Loretto via Wickmedia Commons. Taking a break in the city I love the most. See you in May…. Yikes! Is it the creature from the red lagoon? 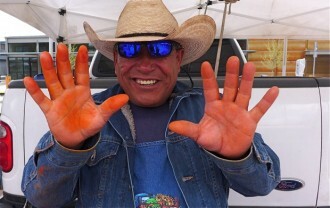 No, just Chencho Ochoa, chile grower extraordinaire, at the Santa Fe Farmer’s Market, displaying his day-glo hands: only one of many surprising encounters I had in this adobe fantasy town. For the last few weeks, I’ve been struggling. The “problem”—if I can call it that—is how to plan a relaxing trip to Hanoi and other points in Indochina. None of the places we’re going are unknown—or unvisited. Although Hanoi is at the beginning of our trip, it’s usually the last stop on the typical Vietnamese package tour. Most popular site: Uncle Ho’s mausoleum, in which one can view the leader’s embalmed remains. Angkor Wat is on practically everyone’s bucket list, mine included: Last year over 4.5 million people descended upon Cambodia, many of them for an intensive few days spent clambering around the millenium-old temple complex, now apparently crumbling beneath the onslaught of tourist hands and feet. Then there is Laos. The whole country, including the fabled city of Luang Prabang, is off the beaten path, but even so, some complain that the sunrise tak bat ceremony, in which saffron-garbed monks receive rice and bananas from almsgivers, has become a “dog and pony show” for flashbulb-popping tourists. We’ll take a small boat up the Mekong and Nam Ou rivers to walk in a cloud forest, but will we find solitude on the trail? I wonder. Do I sound crabby? Even before I’ve set foot on the plane to Hong Kong? Actually, this is a new phase for me. All my life I’ve wanted to see more when I travelled. On our honeymoon in Portugal, when we passed a sign that read “Espana-274 k,” I looked longingly at my new husband. “Couldn’t we just…?” His resounding groan (as in, “What, are you crazy?”) was my first inkling that we might have divergent travel desires. But lately, I’ve begun to see the wisdom of B’s approach, especially when it involves the vacilando. Wandering with little or no plan in mind, accidents happen, many of them happy. We get lost in the New Mexican desert and find ourselves in a storehouse of Asian antiquities. Or go to a cathedral to light a candle but stay for a teary rendition of “Amazing Grace” played by two kilted bagpipers. 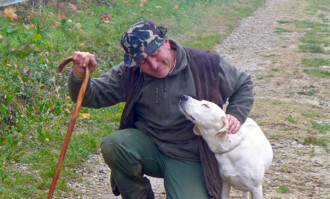 A chance encounter in Vienna leads to an afternoon of tippling the most delicious white wines at the village home of the 42-year-old winemaker. You get the idea. We didn’t plan anything—it just happened. Even the best laid plans suffer insidious to-do creep. Talking with Vietnam’s most decorated fighter pilot about his missions in the American War? Sure! An organized market visit and cooking class in Laos?Absolutely. Touring the lesser temples of Angkor with a professor of archaeology, then visiting a farm family to “learn about contemporary life in Cambodia?” Wouldn’t miss it. And suddenly you find that you haven’t left a moment unplanned, except maybe when you’re sleeping. 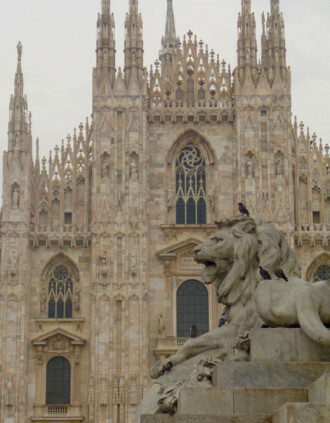 Travel agents are happy to fill your schedule with must-dos and -sees, but too much of even the good stuff can turn a vacation into a forced march. 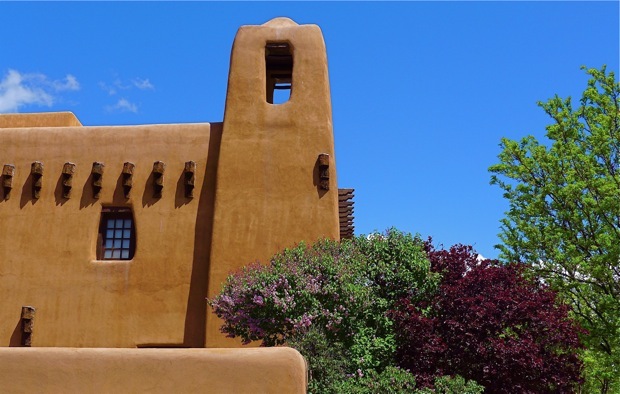 The pleasures of not-planning became delightfully clear during our last visit to Santa Fe. Almost my entire life, I have loved this dreamy adobe town, especially its high desert setting and the way the light changes with the hours, turning ultra-violet just before dusk. To me, it’s like dropping off the map into a mysterious country where the language is the same (English or Spanish), but there’s such a disconnect with the outside world that nothing (traincrashes, Kardashian antics, even the latest tech must-buy) has anything to do with you and can therefore be blissfully ignored. If I could own a house anywhere in the world, it would probably be here. As it happens, B and I have returned, as visitors, for many years to a modest adobe abode that sits on 12 acres of cactus and pinon. As soon as we open the front door, it feels like home. Everything is familiar, from the views of the gently sloping Sandia Mountains right down to the maddeningly overstuffed kitchen drawers. But when even the most adored place becomes a little too familiar, you know it’s time to make changes, the kind that will either reinvigorate your love affair or cause you to move on. On this, our 10th or 11th trip to Santa Fe, we managed to chuck most of our old routines. We didn’t plan our days too carefully. We left ourselves open to surprise. The day after we arrived, for instance, we discovered a labyrinth. Actually there are 33 of these spiritual pathways in Santa Fe, a place well known for its mystical leanings. But we had never had an inkling until we read about a celebration of World Labyrinth Day at Frenchy’s Field Park. 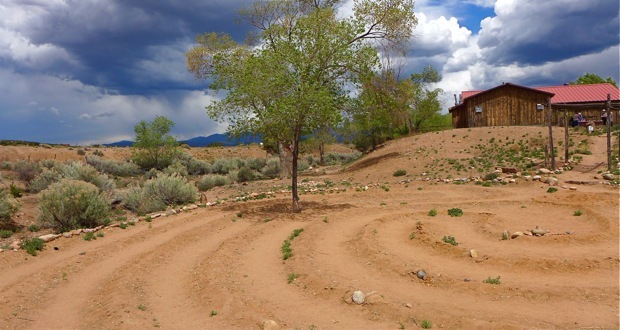 The adobe labyrinth we found there was perfectly configured for a meditative stroll in the desert. 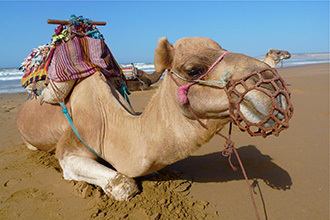 Dug out by hand and stomped by foot, its seven classical circuits were bordered by curved ridges of hard-packed mud and straw, stones half-buried in the earth and random mounds of dark green desert brush. “Oh, they’re just weeds,” said a grey-haired woman wearing a brimmed straw hat and a purple outfit. One of a small group of aficionados gathered there, she invited us to take a turn. Right on cue, as we stepped onto the path, a dramatic storm churned out of the north, with furious black clouds and gusty winds that set the Tibetan prayer flags on one tree to flapping wildly. In the distance, translucent sheets of rain fell like swathes of dark watercolor. Before you walk a labyrinth, it is often suggested that you pose a question, usually about something that has been troubling you: writer’s block, loss of love, a longing for world peace. The labyrinth’s meandering route, which is said to resemble the twists and turns of the human brain, is as spiritual as it is physical—and the act of slowly following the “unicursal” (one-way) path may lead to an insight or even a resolution by the time you arrive at the center. Photograph of Georgia O’Keeffe, taken by Alfred Steiglitz in 1918, via Wikimedia Commons. A few days later I found myself at the Georgia O’Keeffe Museum. 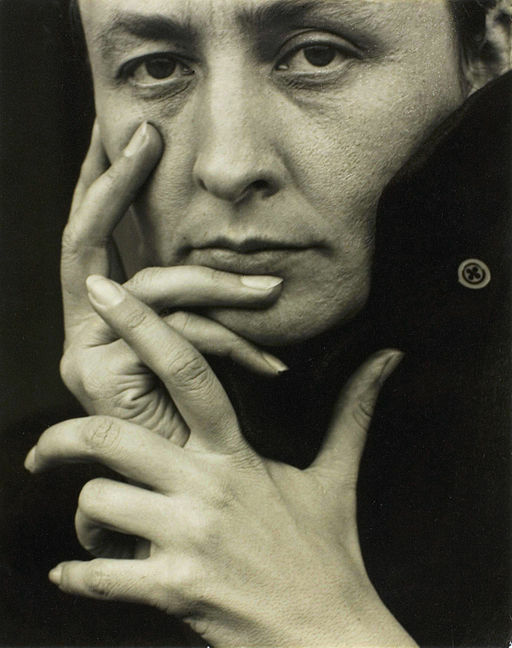 I’ve always found O’Keeffe to be an intimidating presence. Contemporary photographs—such as this one, taken by Alfred Steiglitz, her future husband, when she was just 31—show a taciturn woman, lips pressed firmly together, hair pulled back severely, with hooded eyes that appear to appraise the viewer only to find him (or her) wanting. In front of O’Keeffe, I always feel like a fool, even if she is just glaring at me from the computer screen. In fact O’Keeffe spent most of her later life (from 1949 until her death in 1986) at Ghost Ranch, north of Abiquiu, where she painted luminous, almost surreal images of the New Mexican desert, many of which can be seen at the museum in Santa Fe. But as much as I admire her work–I would die to own even a scrap of canvas that she painted–I’ve always imagined that she was a grim person, one who was not easy to be around. 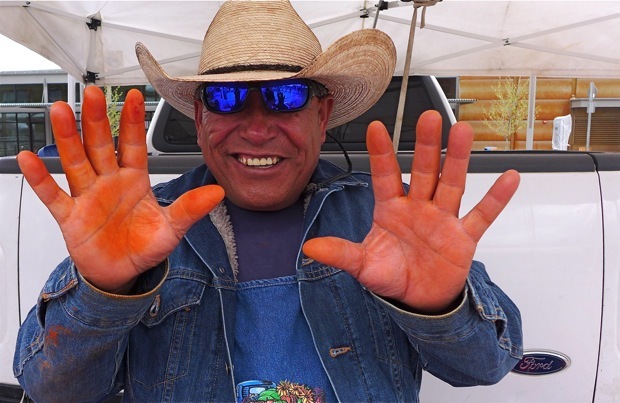 When I walked into the museum, there she was, in a giant photograph on the wall by the visitors desk, sitting astride a dusty motorcycle, arms around fellow artist Maurice Grosser’s waist, hitching a ride back to Abiquiu. In this photo, taken by her friend Maria Chabot in 1944, the woman is actually grinning from ear to ear. She looks happy! 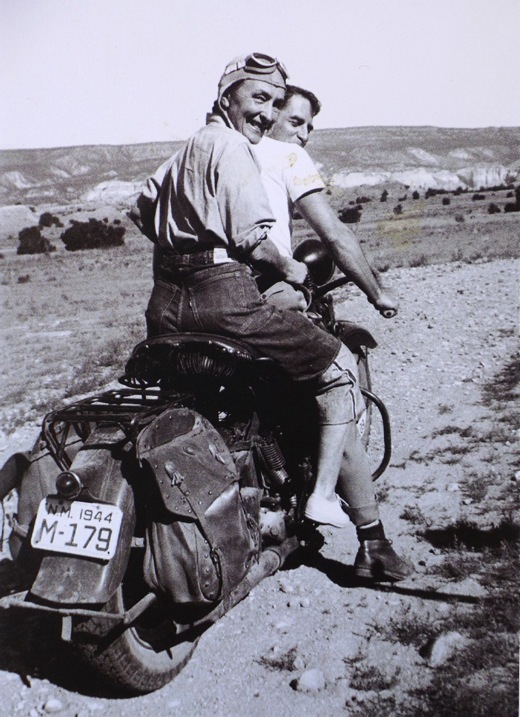 Georgia O’Keeffe, riding a motorcycle at the age of 57? Almost laughing with delight? Who knew? Of course this revelation meant that I had to go to Abiquiu, not for a formal tour of her home or studio, but just to soak up the atmosphere and see a little of what she saw. We were lost, in the middle of nowhere. 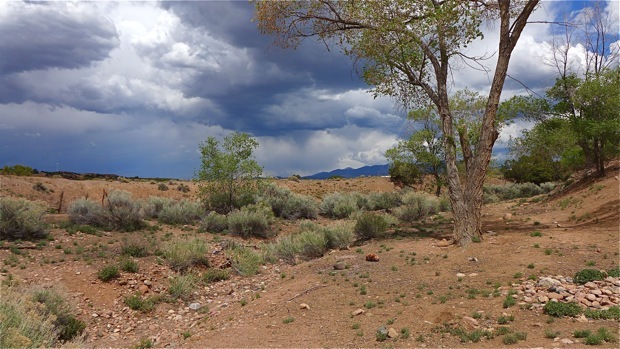 But here’s the upside: We had unwittingly stumbled onto a solitary patch of northern New Mexico scrub land over which O’Keefe herself might at one time have walked or ridden. This was her territory, and the isolation was both wonderful and overwhelming. We didn’t see the magnificent canyons or striated rock formations that appear in her remarkable paintings, but under the wide open sky, brush all around and treacherous sand underfoot, it was possible to feel what might have drawn her so inexorably to this part of the world. It’s dangerous to project yourself into another person’s mind, but in that moment, I could easily imagine what might have inspired her. 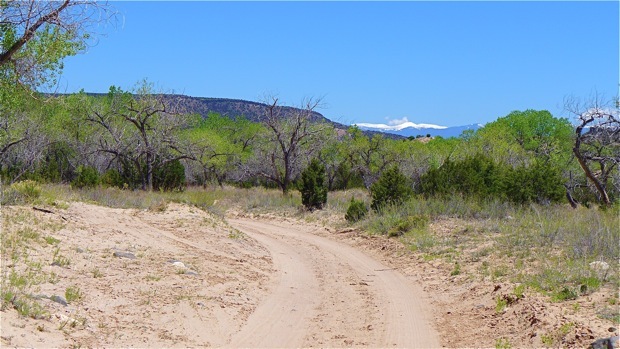 Eventually, of course, we reached Abiquiu by more ordinary means. It’s a dusty, almost nonexistent town, with a few ruined adobe houses, a derelict bar and a church with a well-tended garden. O’Keeffe’s home was hidden behind a low adobe wall, inaccessible except to organized groups. But accidents will happen. We wandered through a gate and down a path that led to an historic general store. 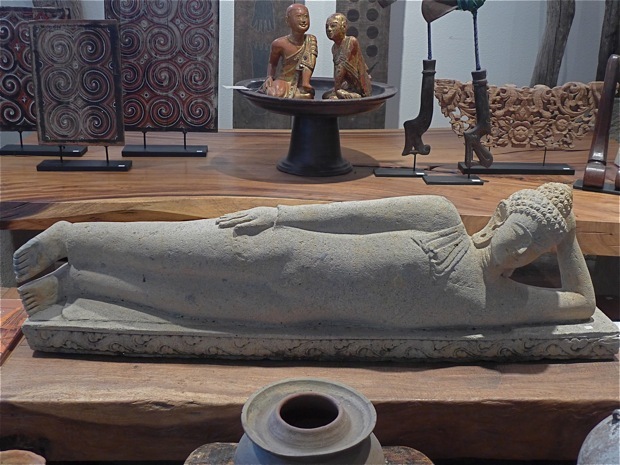 Inside, instead of chewing tobacco and bolts of calico, we discovered a trove of Southeast Asian and tribal treasures collected by a man named John Bosshard who once had a much admired gallery in Santa Fe. For hours we drifted happily through those adobe rooms, admiring Burmese Buddhas and Indonesian benches, vintage Yunnan textiles and green glazed Vietnamese vases, as he regaled us with tales of his days as a tour guide in Indochina—a nice bit of serendipity. In the flowering gardens, a spirit house from Thailand stood watch over the Chama River and the steep cliffs beyond. It’s amazing to me how objects from other continents fit so well into the New Mexican aesthetic. Even more amazing: my non-shopping husband who decided, on the spur of the moment, that the serenely reclining, Borobudur-style stone Buddha was exactly what our garden needed. If you take a chance, who knows where you’ll go? I would be remiss if I didn’t tell you what we ate in Santa Fe. We went on a serious quest for a green chile cheeseburger to replace the Ur-burger served at the late, great Bobcat Bite. 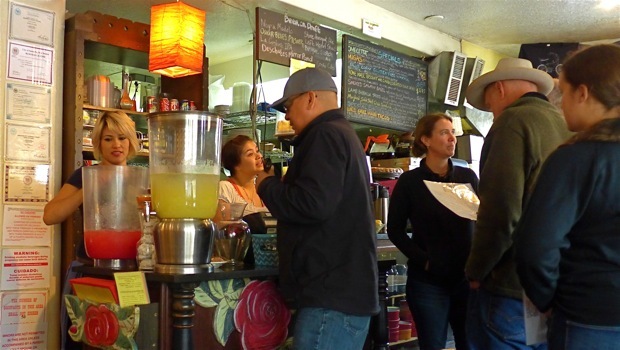 We had some good ones and some bad ones, but the search led us to Tune-Up Café, a cozy little joint run by Salvadorean Jesus Rivera and his wife Charlotte that might just be one of our new favorite hangouts. 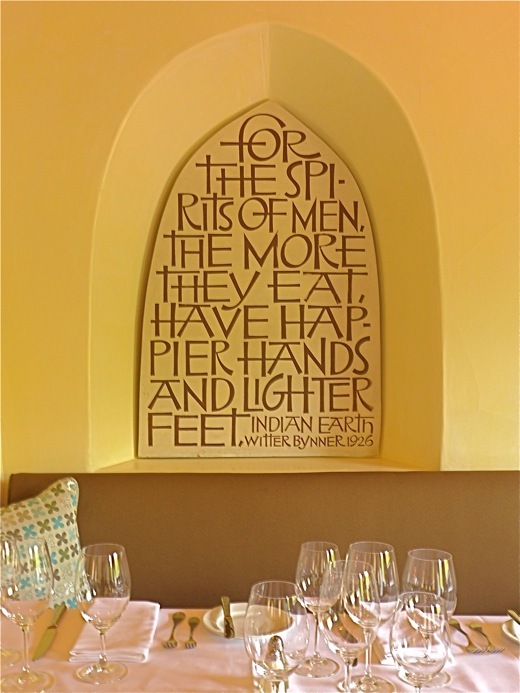 The menu is scrawled on the blackboard over the rose-decorated counter where you line up to place your order. There are authentic Salvadorean specialties such as pupusas—tasty cornmeal “patties” stuffed with flank steak or zucchini, both with queso fresco—as well as buffalo burgers and a credible Cubano sandwich. But I really fell for the savory barbacoa tacos. 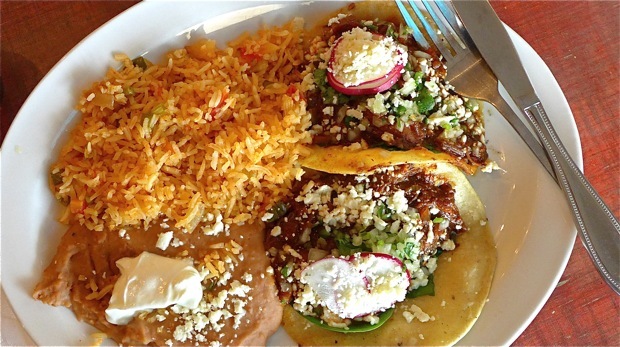 The small handmade corn tortillas, wrapped around tender bits of lamb, are just the right size, and are topped with just enough cotija cheese, chopped onions, radishes, cilantro and fresh spinach to tantalize all your taste buds. Best of all: a thick, dark red, chile de arbol salsa, pleasantly hot and fruity, made of three kinds of spicy dried peppers blended with grilled onions, garlic, tomatoes and green tomatillos. It was so good we paid $10 for a pint to take home. Bonus: A long chat with a New Jersey artist who has lived around the corner for 20 years and just ended a show at a prestigious local gallery. “This is my go-to place. I’m here everyday,” she said. Her name: Robin Williams, and you can see a little of her work here. Then there were the gambas al ajillo at La Boca. It’s a standard dish on many tapas menus, but here the plump shrimp were liberally laced with spicy chiles de arbol and lots of sliced garlic. 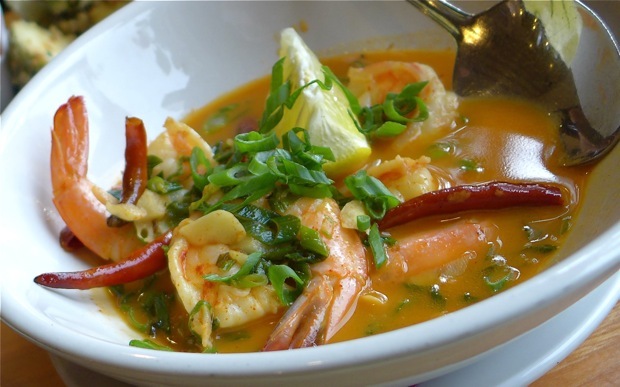 They came swimming in a piquant, smoky-tasting, tomato-y broth so addictive that I lapped up every last drop. Nearly as nice: fried Brussels sprouts with almond and sweet pepper romesco sauce. The first time we ordered this dish, the sprouts were warm and crunchy, the sauce wonderfully redolent of fresh peppers. The James Beard award-winning chef-owner, James Campbell Caruso, has written a cookbook, Espana: Exploring the Flavors of Spain, which has many tempting recipes but not, sadly, for either of these two appetizers. Dinner at the The Compound, a serene restaurant off Canyon Road that’s been around since the ’60′s, offered culinary relief from all the zingy flavors on which I eventually overdosed. It was a visual relief as well: creamy plaster walls, a worn brick floor, a huge vase filled with flowering branches. 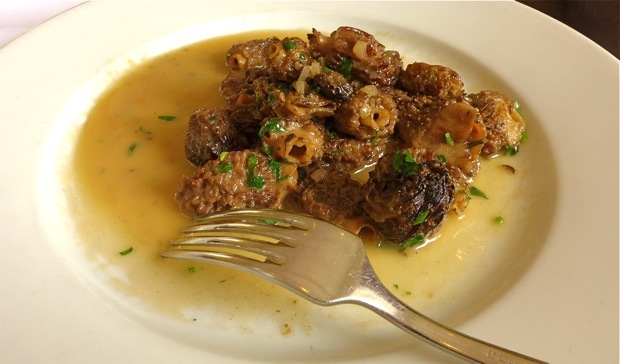 We went twice, lured back after the first visit by an appetizer of luscious Oregon morels, a dozen or so delicately flavored mushrooms in nothing more than a white wine butter sauce and a sprinkle of parsley. Utterly simple, completely delicious. Also really good: Pristine Alaskan halibut over homemade gnocchi, with crispy pork belly and spring peas. And a sumptuous jumbo crab and lobster salad with slivered mango in a tangerine vinaigrette. Did I resist the juicy hamburger with avocado, griddled green onions and roasted poblano peppers? Nope, and it was great–though the search for the Ur-burger continues.